For approximately 14.5 of the 15 years I’ve been teaching, I thought that networking was a fairly pointless activity for teachers. Isn’t networking all about getting another job? I’m perfectly happy where I am, thank you. And that was the end of that. It was like a lightbulb went on when I attended a network PD meeting a short while back. Oh yeah – I could learn from teachers at other schools and find out more about the things that interest me! And this meshes so perfectly with my current interest in Minecraft and other aspects of ICT. 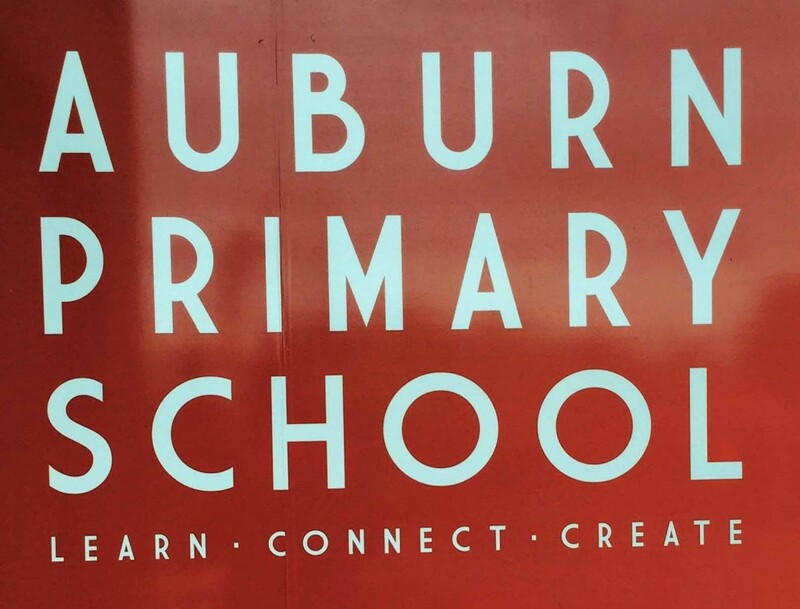 I made a connection with a teacher at Greythorn Primary that is leading up to a visit next week to talk about MinecraftEdu, and last week I spent two hours at Auburn Primary. I was there to check out their PBL (Project Based Learning) program in the 1/2 level, thanks to an invite from my former student teacher, Max, who is doing his internship there. 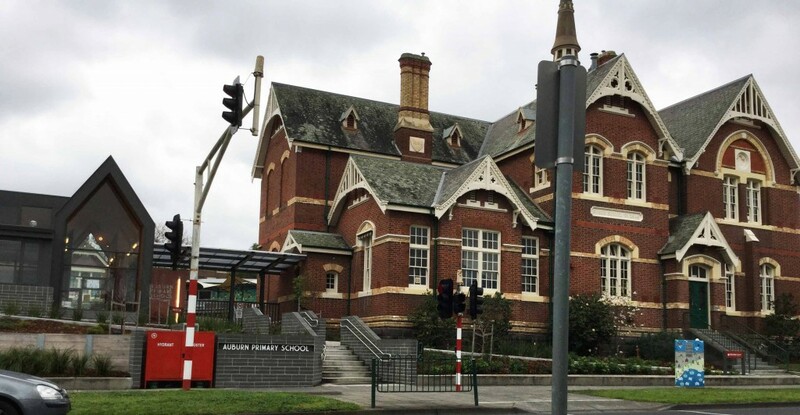 My current student teacher/sidekick, Ellena, and I arrived a tad early and met outside the rather imposing Auburn Primary building. From the cafe across the road (where we adjourned for a sneaky coffee before returning to school) the dark clouds that loomed above gave the old building a bit of an Aadam’s Family feel. We were led over to Max’s room by the jocular deputy principal, Martin. It’s always lovely to enter a school where every staff member seems to be having a great day and every teacher we were introduced to was welcoming and happy to answer questions, talk about their work and let us take photos. 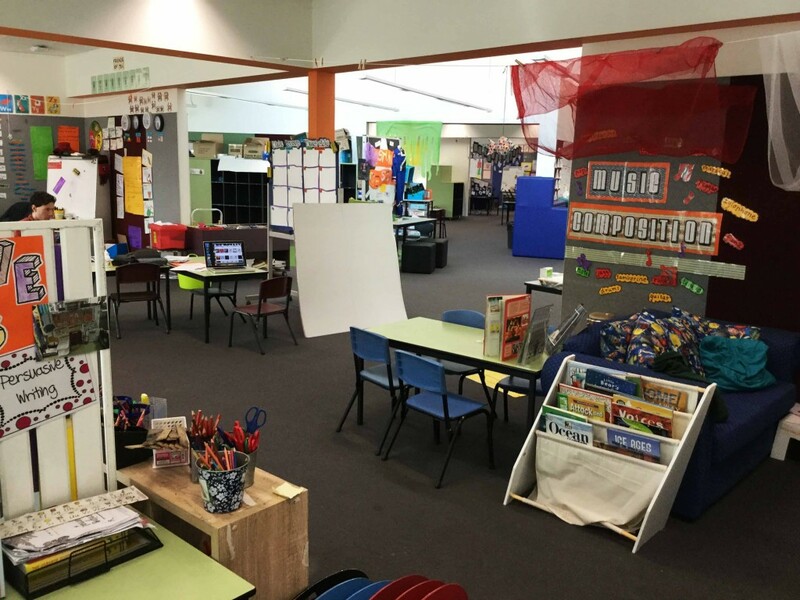 We found Max working in his nook – the 1/2 area is an enormous open plan space with little alcoves for each class. I find this kind of arrangement somewhat daunting as I’ve never experienced a really successful example of it, but I was keen to see how the Auburn staff managed. There were 7 classes of 22 students (I think… I might have the numbers wrong) in the space every day and I just couldn’t imagine how the noise didn’t become overwhelming. It was very pleasant at 8:30am though, and Max took us on a tour to meet other teachers, look at displays and admire all the inquiry spaces. 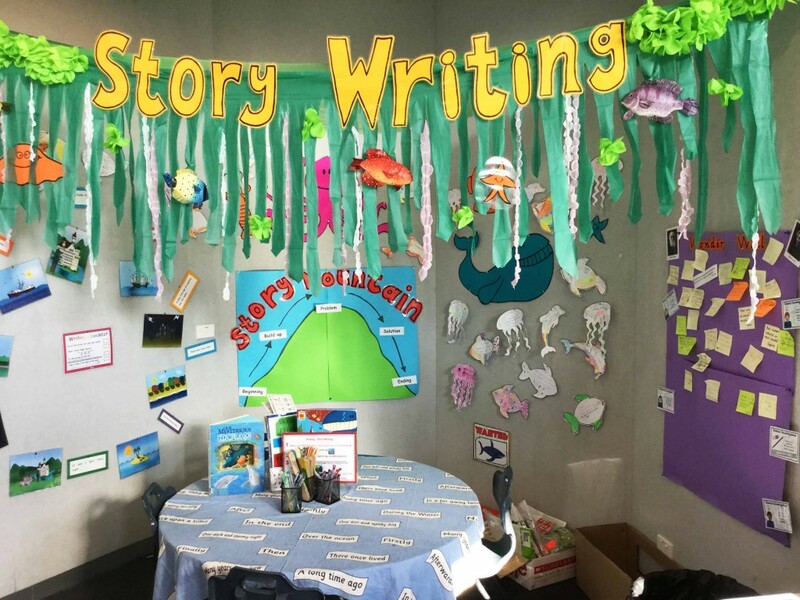 The students were currently working towards the culmination of a unit on the Great Barrier Reef. Their final project was in several parts. 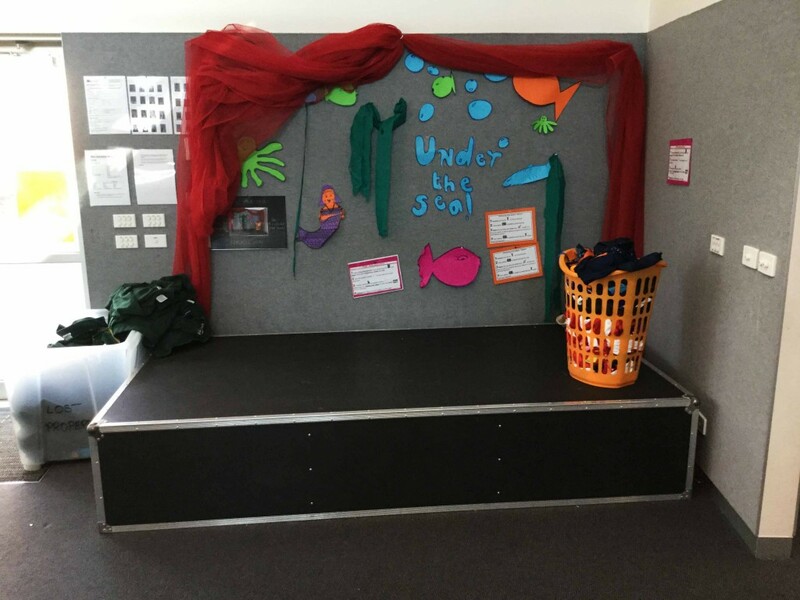 They had to write a play script, design and build a minature theatre, advertise their play and buy the materials they wanted from a shop manned by parent helpers (pictured above with all the supplies laid out). Max told us that the approach they were working with was similar to the Kathy Walker program in that it was an inquiry approach, but students were directed using task cards. They were also encouraged to visit a variety of different coloured stations over a set period. Colours identified which curriculum area each station was aligned. A great deal of work had obviously gone into making each station unique and attractive. Elements of student ownership and input were everywhere. 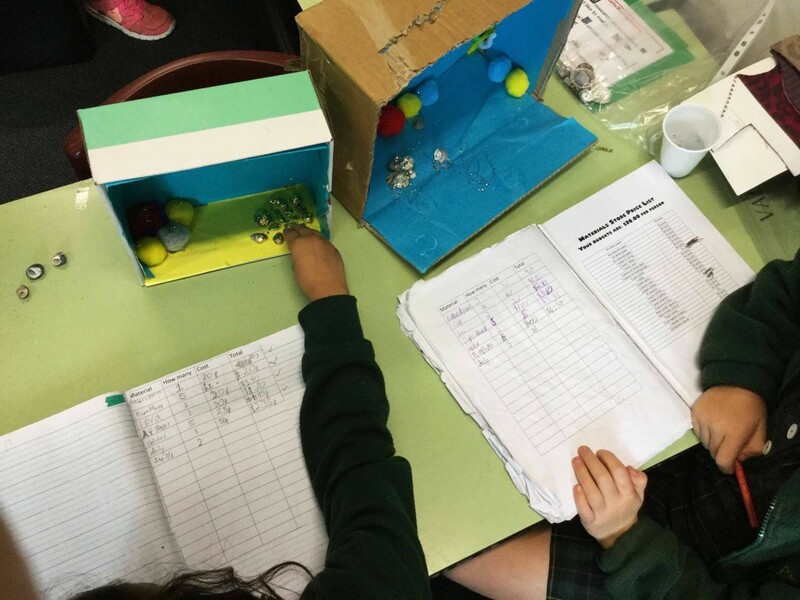 In many ways it was like the inquiry stations in my own school’s Prep and Grade One areas – but with a great deal more space to work with. We watched the students file in at 8:45 then headed to assembly at 9am. I won’t lie. Assembly is not my favourite part of the week, but it was quite interesting to watch another school go through their routine. Unlike Chatham, Auburn sings Happy Birthday to the students who’ve had birthdays that week, and they only sing one verse of the national anthem. In fact, I think Chatham is the only school I’ve ever been to that sings two verses. They had a class performance – each class has a turn, I assume. This is something we don’t do but I really like the idea, and I remember doing when I was in primary school. After assembly we headed back to the classroom. Each group sat with their teacher for a fruit snack and roll marking then they disbanded to work on their puppet shows. There was quite a bit of noise but it certainly wasn’t overwhelming, and the teachers played fun music sporadically while the kids worked. We noticed a few students getting up to do a bit of spontaneous dancing in between tasks. 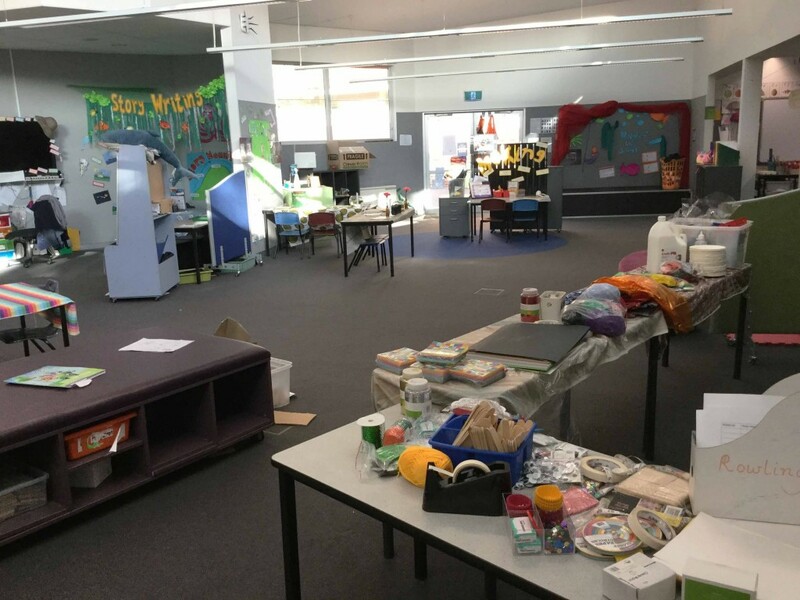 There were parents manning the materials store, students working all over the place, and everyone seemed on task and extremely engaged. There appeared to be a great balance of freedom and structure. Perhaps the best moment of the visit came when Ellena and I spotted a student vigorously hacking into a cardboard box with what looked like a serrated knife blade. Concerned, we walked over to investigate. The student showed us his tools and they were amazing. The knife was made of plastic and unable to cut skin but perfect for boxes. 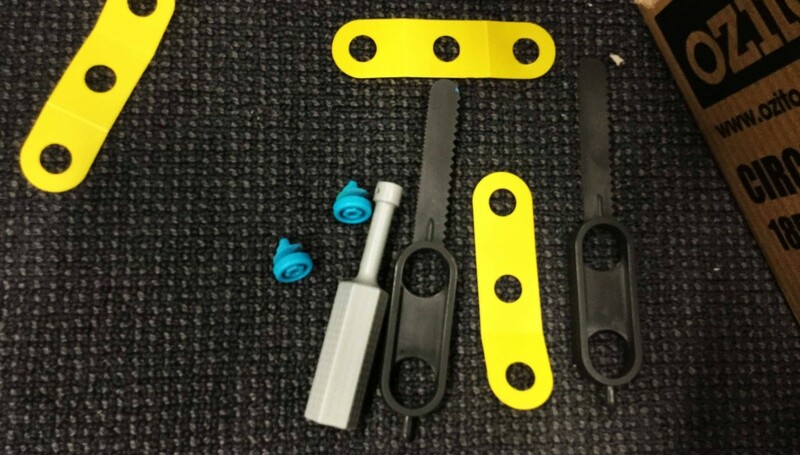 There was a large bag of other bits – plastic hinges, screws (technically called ‘scrus’) and ‘scrudrivers’. All invented and sold by the student’s dad. The boy kindly gave me one of each and instructed me on their use. He also gave me the website address. I strongly encourage you to go look at this simple but elegant solution to construction for kids – I’ve done a poor job of describing how versatile and empowering it can be. Here’s a photo of the tools. I took them back to my class and the students immediately wanted to use them, so I’m hoping several sets can be bought for a few grade levels at my school – if for no other reason than I hate covering boxes with miles of sticky tape that then makes them difficult to take apart and recycle. After about an hour in the room, Ellena and I said our goodbyes and headed back to Chatham, heads full of ideas and thoughts on the future. I felt grateful for the opportunity to visit and wished for more time to see other grade levels in action and also for opportunities to see how edtech is used at a school that is further along that road. Currently Auburn have a 1:2 tablet program in the junior years and I’m interested to see how they manage devices, how they monitor students who are using technology and what apps they find useful. I had a quick chat about data storage with one teacher and thought afterwards that I should’ve mentioned Showbie as an option – although I’m hardly an expert. Where and how student work is stored when there are so many devices to use is something my school will probably be considering shortly. I imagine that making sure each student has the same tablet each time is slightly challenging, whereas having an account in the cloud would make more sense – and make work more accessible to teachers too. If anyone from Auburn is reading this I’d love to read your thoughts on the subject so please do leave a comment :-). Visiting another school was incredibly valuable. Not only did I get to ask questions, I was able to see things happening that I wouldn’t have even thought to ask about. I’d definitely encourage anyone reading this (particularly those in Melbourne’s Eastern Region!) to consider begging, borrowing or stealing a few hours and spend a session or two visiting another school. 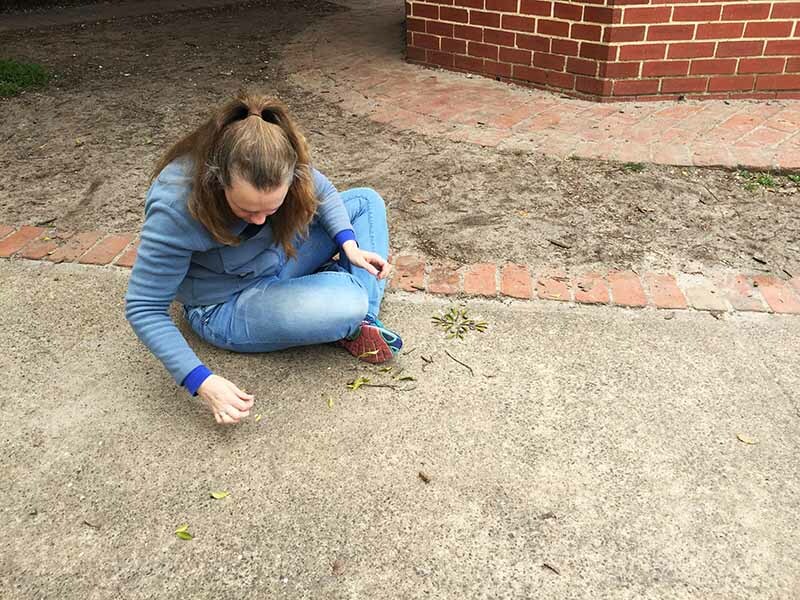 I’d be particularly happy to set up some reciprocal visits with my school – if you’re interested leave a comment or join the new ‘Boroondara Teachers’ group on Facebook. I’d also be interested to know if any teachers reading this do regularly or sporadically visit other schools and what you’ve gained from the experience. Do leave a comment and let me know :-). The mini stage in the classroom area. I LOVE this! If any Auburn teachers are reading, I’d love to know where you got it. Next: what I learned at Greythorn Primary! I’ve been teaching for 15 years, had my own class for 8, and had a student teacher every chance that I’m offered one. Some teachers never seem to volunteer to share their classroom, but I think that an important aspect of being in such a vital profession is contributing towards its next generation. Occasionally people complain of lacklustre student teachers, but perhaps I’ve just been fortunate to work with a string of motivated, passionate and good-humoured student teachers who match (or put up with) my somewhat relaxed style of classroom management and personal organisation. Apart from having someone to shake my head at when students say and do hilarious things, student teachers bring new ideas to my room and my teaching and today was a terrific example. Ellena, is a fourth-year student studying at RMIT, and is with me for three weeks. Confident, competent and at ease in the classroom, Ellena asked to do some mindfulness activities with the class and I was all for it. 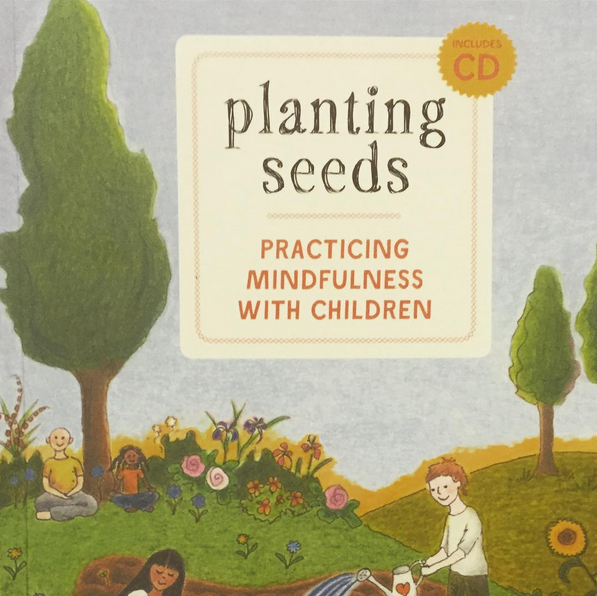 Recently we’ve begun a focus on mindfulness at my school, led by one of the year six teachers. So far we’ve primarily used an app called Smiling Minds, which has a calm voice and quiet music to relax to and focus one’s thoughts. She explained the session to the students before lunch and then in the afternoon we walked around to the front garden area of the school and the students found their own spaces and followed the instructions. First they were to observe their environment and look at the materials available. 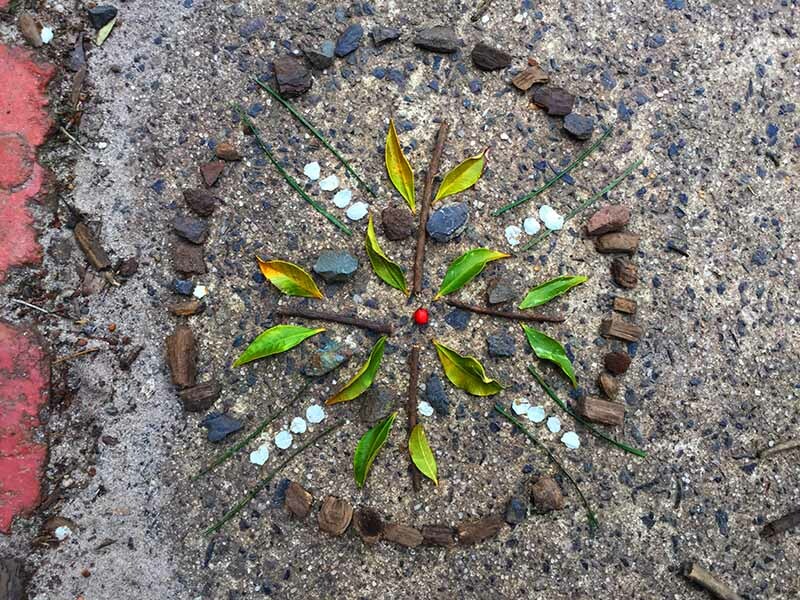 They could use whatever they found to create a mandala. Ellena had shown them some images online to give them a bit of inspiration, but assured the students that whatever they wanted to create was fine. The main idea was to focus on the task and get into the moment. I lost no time finding my own space and was pleasantly surprised to see how quickly the students found their own place to begin. Some wandered around and picked up bits and pieces, but most became focused super quickly and were clearly getting right into the zen of it. I loved it. 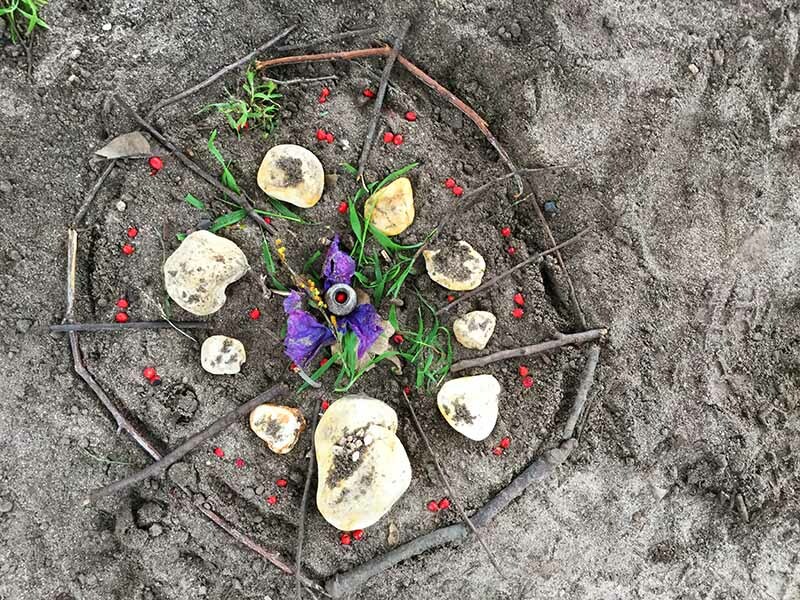 Getting immersed in creative tasks is something I do pretty frequently anyhow, but being surrounded by children doing the same thing was quite magical. 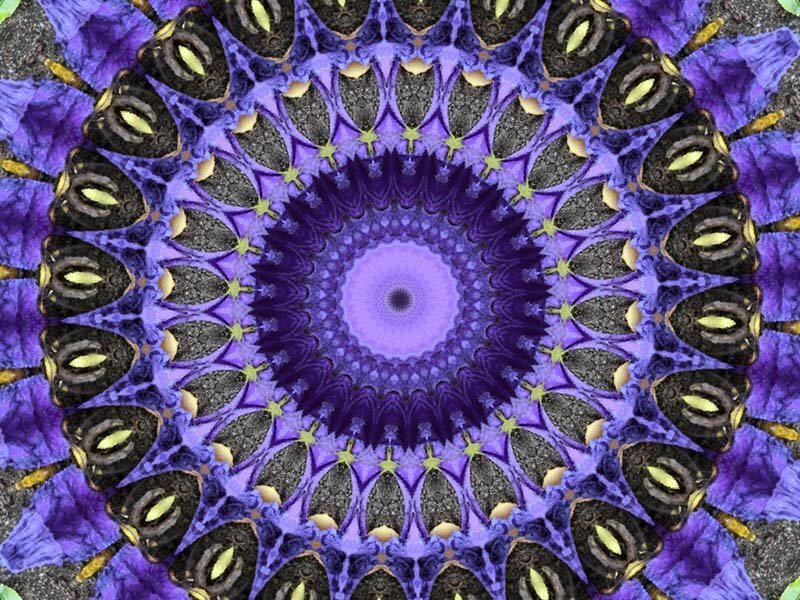 Ellena walked around and took photos and one of the students suggested taking some pictures with an app we’re all enjoying right now – a kaleidoscope camera. Just one purple flower produced an amazing result. 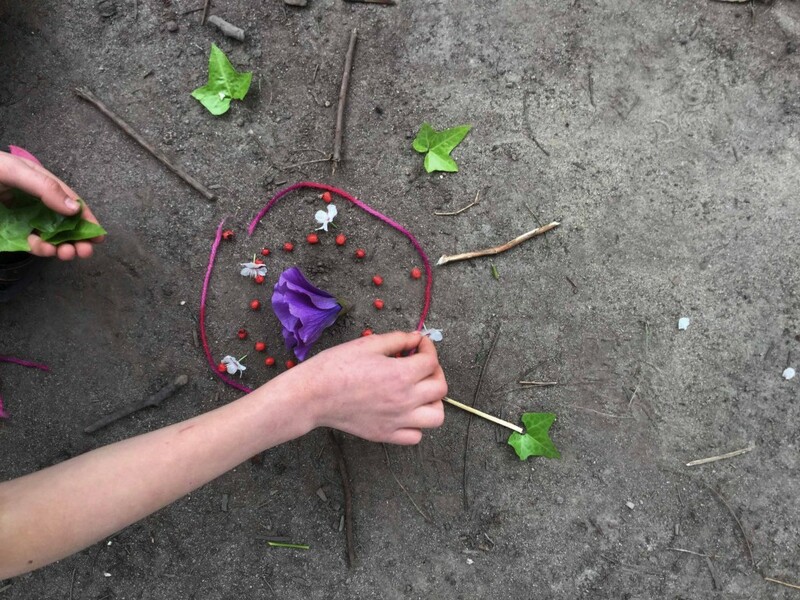 After a while the students wandered a little and quietly whispered their appreciation of each other’s work. It was all over far too soon for anyone’s liking, but I’m hoping the students take this idea away and do it sometimes by themselves, or share it with their siblings. The activity also provided good opportunities to consider pretty high-level concepts, such as the transitory nature of art and creation. We discussed the fact that our art was a process that we enjoyed in the moment but would probably be completely gone by the next day (or almost immediately, in the case of a few pieces that were stepped on accidentally). We’ve been talking a lot about resilience this term and the students whose work was destroyed were quite sanguine about it, which surprised and impressed me. Perhaps the kids were just too calm and happy to be bothered getting upset. I know the session took a weight off my shoulders. 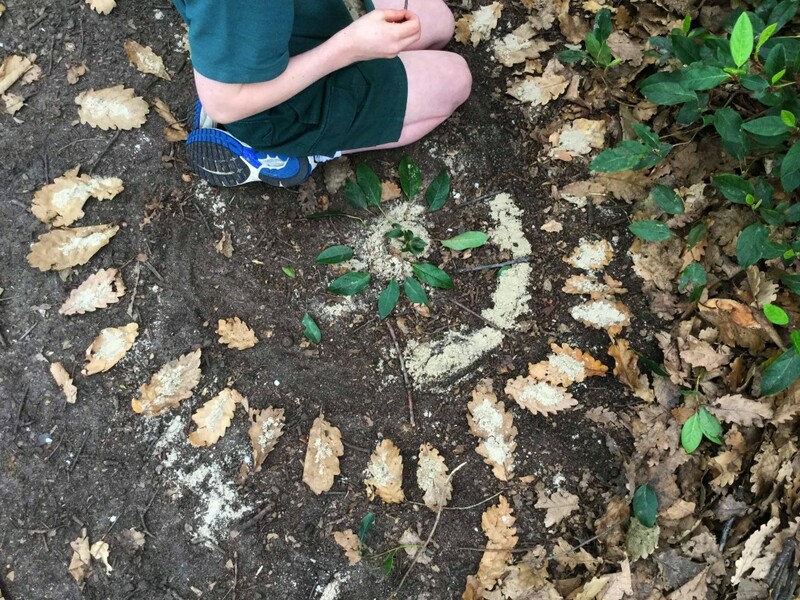 Getting to play alongside my class is a rare joy and I was buzzing for the rest of the afternoon, the recent sensation of being a bit stressed and overloaded had dissipated and I felt refreshed. So engrossed I didn’t realise my photo was being taken. So thanks, Ellena. And thanks to all the other funny, clever, generous and adaptable people who’ve shared my classroom over the last decade or so. I’ve appreciated every one of you! I know what I’ll be doing on my next trip to the beach … or maybe just the next sunny day I spend in my backyard.